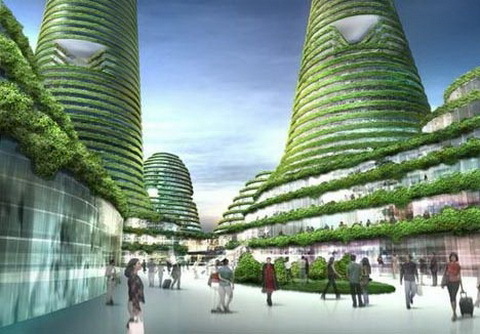 Green City Of The Future. Eco-designs are being developed everyday. Society’s awareness of our global situation is growing. Whether your motivation is to save money or the environment, with newest technologies those two go together. Why waste money on gas, when you can have car that doesn’t even need it. Or paying too much for electricity, when pure energy is waiting for us right outside our window. I have a dream, just like Martin Luther King once had. A bright future depends on what we do right now. Einstein said: “Everything you can imagine is possible.” I practice imagining a new world that will be inherited by our descendants. Nevertheless, surviving with such population growth creates food shortage, we need to rethink the whole system structure and let new fresh minds take over. Vegetarianism will be the global diet. That’s the only way to supply enough food to sustain life and harmony with nature. More people will be growing their own food, apartment complexes will have organic gardens. More trees and greens to keep air production stable. More public transportation available everywhere, more parks and regulations to protect this inhabitant. Ocean life will be in abundant because we will keep this planet clear from plastic and pollution. Zero waste. A lot has to be change but I keep this image in mind. I trust with all my heart, that humans can achieve such goal. After all we have potential, if we destroyed the balance then we just have to find a new one. To save what we already have and fix the damage. It’s going to be the highest lever of existence with awareness for every aspect of life. Wouldn’t you want to live somewhere with beautiful tress, nature, fresh air, long walks and happy neighbors. Once we let go of greed, we’ll start to enjoy things that really matter like having family, friends, health. When I think of China, I sadly think of pollution. China is the faster growing economy with biggest polluters. I guess economy doesn’t involve thinking what’s left behind. It’s numbers… In craziness of manufacturing, using natural resources till nothing left somehow amazing ideas are born. 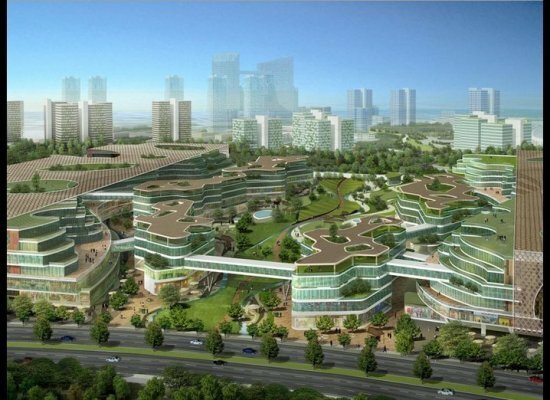 Intelligent groups are working on new green city. It’s already in process. They are stepping in a new era of evolution. They are building the whole ECO CITY. Here is what they say about it. Expected to ready in 2020. Is one of these real-life sustainable communities, spanning 30 square kilometers and showcasing the hottest energy-saving technologies. Designed by Surbana Urban Planning Group, the city will have an advanced light rail transit system and varied eco-landscapes ranging from a sun-powered solarscape to a greenery-clad earthscape for its estimated 350,000 residents to enjoy. Eco-City will make use of the latest sustainable technologies such as solar power, wind power, rainwater recycling, and wastewater treatment/desalination of sea water. In order to reduce the city’s carbon emissions, residents will be encouraged to use an advanced light rail system, and China has also pledged that 90 percent of traffic within the city will be public transport. The city will be divided into seven distinct sectors – a Lifescape, an Eco-Valley, a Solarscape, an Urbanscape, a Windscape, an Earthscape and Eco-Corridors. Surrounded by greenery, the Lifescape will consist of a series of soil-topped mounds that will counteract the towering apartment buildings of the other communities. Demonstrating the concept of a compact, multilayered city, the Urbanscape will be the core of the Eco-City, featuring stacked programs interconnected by sky-bridges at multiple levels to make efficient use of vertical space. 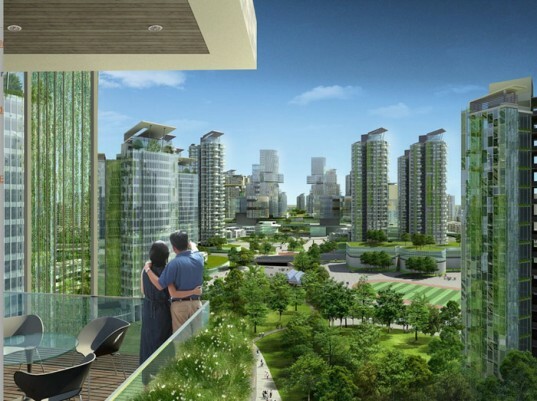 In contrast to the Urbanscape, the Earthscape will act as a sort of suburb of the city, with stepped architecture that will maximize public green space. This entry was posted in alina wheetley, china, city, eco, Environment, future, going green, new world, organic, pollution, recycle, reusable, save the planet, Uncategorized, vegetarians and tagged alina wheetley, china, eco, eco city, eco-friendly, environment, future, going green, green, organic, planet, pollution, save the planet, vegetables, vegetarian. Bookmark the permalink.